Make your life as a BI Admin easier. OBIEE will typically connect to the database using a generic application account. The problem is that you lose a lot of visibility of work both up and down the stack. An OBIEE query is causing a problem on the database – how do you identify the originator? You want to investigate the performance of an OBIEE query, but how do you identify which DB session it is? We know SID 491 is causing a problem, but how do we identify the originating OBIEE user? You could start piecing together Usage Tracking and NQQuery.log files, but it’s hardly convenient or instantaneous is it? Now we can see which OBIEE user fired the query resulting in SID 491, and not only the user, but the dashboard and request name they are running. This works in both OBIEE 10g and 11g. See my previous post here for further background, and discussion of the procedures used. In essence, we harness internal OBIEE session variables which hold the user ID, name, dashboard and report name. We put a set of database calls on the connection pool(s) associated with query requests. We have to do a bit of trickery to work around two issues. Firstly, the variables may not be set (you may not have saved your new request yet, or may be running it outside of a dashboard). To get around this, we create two dummy session variables with the same names, and populate them with dummy init blocks. Secondly, there is a limitation to the number of characters that can be passed through, and so we manipulate the string if necessary to use the right-most characters. Be sure to use a connection pool which isn’t used for queries. Load up your RPD. If you haven’t already, create a new connection pool that is just for these init blocks. It can be to any database – in the examples below it’s an Oracle one, but any that supports selecting from a dummy table like DUAL in Oracle. Go to Manage -> Variables, click on Session -> Initialisation Blocks. Right click in the section to the right, and select New Initialization Block. Click on Browse to set the Connection Pool used. The connection pool should be one exclusively for init blocks (not the same you use for queries). If you try to use the same connection pool as for queries, you’ll most likely get an error when you logon. If the Test doesn’t succeed then you need to fix the problem before you continue. Click on New to create a new variable, and give it the name SAW_SRC_PATH. Make sure you get the name exactly correct, no typos. Give it a default initializer, and then click OK. Assuming it works, then click OK to save the new Init Block and Variable. Add these three SQL statements to the “Execute before query” of “Connection Scripts” of each Connection Pool which is used for queries. Do not add them to ones which are used for init blocks / authentication etc. Client Info is the user’s display name. Module and Action are populated with the dashboard name (prefixed by “OBIEE”) and report names respectively, truncated to the left if necessary to fit into the field size. If you’re currently logged into Answers, logout and log back in. This is necessary for the dummy session variables to populate. Run this sql*plus SQL script below to look at any existing OBIEE queries running on the database. Not a fan of sql*plus? It’s occurred to me that by parsing in user-provided values to a string that’s executed on the database, there could be the potential for a breach through SQL Injection via a maliciously named report or dashboard. I’ve not been able to find a report name which does cause trouble, but I have never tried exploiting SQL injection before. It is another good reason to make sure that you’re using a DB account solely created for reporting queries from OBIEE, because then its privileges can be greatly restricted. This isn’t an excuse not to test for SQL Injection, but a reminder of why good practices such as granting of least privileges exist. If you’re having problems implementing this, or doing further playing around with it, you can see the exact SQL that’s executed on connection by bumping up LOGLEVEL and checking NQQuery.log. Don’t use the same connection pool for the init blocks as you do for queries. If you try this, then the init blocks will fire and try to submit a command on the database which requires the variables that the very init blocks are trying to populate. Confused? OBIEE certainly will be too. Here’s a quotation that I’ve just read and wanted to share. It is all part of a BAAG approach to troubleshooting problems, performance in particular. The unfortunate part […] is that rarely anyone goes back and does the root cause analysis. It tends to fall into the bucket of “problem…solved”. Just because something produces the correct numbers on the report, it doesn’t mean you can stop there. How you are producing those numbers matters, and matters a lot if you have an interest in the long-term health of your system and its ability to scale. OBIEE is the case in point here, but the principle applies to any architecture with >1 tiers or components. Let me start with a rhetorical question. The user has got a report which has ten rows of data. Which of the following methods is going to be a more efficient way to generate the report? Considering OBIEE specifically, you should be aiming to be able to answer all of your questions on the database directly. As soon as you start using the database simply as a source for dumping big volumes of rows into your OBIEE server, you’re storing up problems. An RDBMS is designed for crunching lots of data. You’ve already lifted all that data off the disk when you selected it out of the tables on Oracle DB – why not get Oracle DB to do the additional processing required too? Where’s the benefit in lifting & shifting all of that data to then reprocess it again? In fact, consider why you’re crunching big volumes of data each time in the first place. If multiple people have the same big queries, are you missing some aggregates in your data source that would support these queries much better? Or do you need to be looking towards multi-dimensional sources such as Oracle OLAP or Essbase? The flexibility and power of OBIEE to do its own calculations and aggregations on data is a double-edged sword, and one to be wielded with responsibility. It is a great feature and one which cannot be avoided if you’re using federated queries across disparate sources. But if you’re using it out of ignorance or laziness to brute-force a solution instead of doing the big work at the lowest level possible then you’re asking for trouble. If you rely on OBIEE to do the heavy work of your reporting solution, then you need to factor this in to your hardware spec for the machine. As a reporting interface to well aggregated data with fairly simple reports, we’ve found that it runs at minimal CPU, and doesn’t stress the disk. You can predict fairly reliably that this should scale just fine so long as your database can. But if you put the workload on the OBIEE server too, you’re going to hit bottlenecks much sooner. The principle of moving as little data around as possible is described by Cary Millsap as “Filter Early” and described well in his blog article. Thanks to @RonCrisco for helping me remember the name. @cdturri pointed out that it’s also just common sense :-). Applying it to a specific system, Exadata uses it in its SmartScan technology where it applies filtering of data directly on the storage rather than bringing all the data back up to the database SQL processing layer (h/t @ocpdba). Here’s an example of a situation where all is not well in OBIEE-land. These are temporary files generated by BI Server (nqsserver), and for those of you viewing in black and white, those files are getting on for 30GB a go! 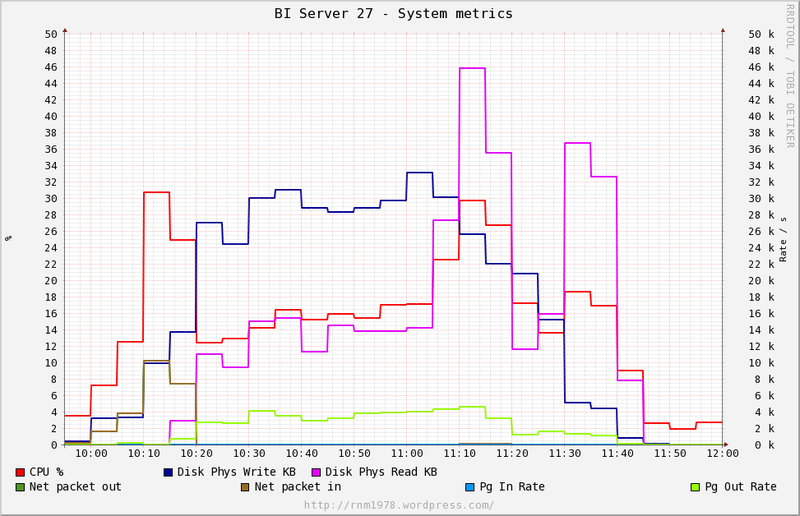 Notice that the server starts paging out during the work, and there’s a lot of disk activity – both read and write. CPU goes from a normal c.5% up to 20-30%. This was one user doing this — care to place bets on how the system would perform if it were rolled out to ten users running this kind of workload? There are a few easy ways to look out for this bad behaviour. The first is in Usage Tracking, where you can look at S_NQ_ACCT.CUM_NUM_DB_ROW and compare it to S_NQ_ACCT.ROW_COUNT, even writing an alert for when this ratio goes above a defined threshold. You could also look at an alert on S_NQ_ACCT.CUM_NUM_DB_ROW going above a fixed number, since depending on your system’s purpose and architectural principles you might want to aim to never be pulling back more rows from the database than necessary for a report. I’d also pay close attention to S_NQ_ACCT.NUM_DB_QUERY, as this will show you reports generating more than one query on the database and thus increasing the workload on the BI Server processing the combined results. Another thing to check is the NQQuery.log, looking at the number of bytes returned from a database query. This could feed into some kind of generated alert for closer investigation if a query returns above a certain number. [nQSError: 46118] Out of disk space. How do you assess your development projects for quality? You presumably are keen that the reports match the specifications and return the right numbers. You hopefully also have NFRs for how quickly these reports run. But what about system impact of new developments? How do you quantify this? Unless you are delivering a standalone project, fire-and-forget, then maybe you can performance test for load and concurrency up-front to validate how well your solution will scale to the required users. But lots of BI projects are iterative and may well be across functions too. Just because your development project is first to land it doesn’t give you the right to dump a steaming pile on the servers and proclaim that it works with your user volumes and meets their NFRs, so all is well. What about all the projects that come along next, and are going to be hindered by your mess? This is where another double-edged sword comes into play – “Best Practice”. For me, Best Practice is a way of doing something that multiple implementations, time and expertise has shown to be the best way of not screwing up. It is the starting point from which to work, understanding deviations as required. What it is not, and what gets it the bad reputation, is a fixed set of crude rules to be adhered to blindly and implemented without questioning or understanding. If a system is not adhering to the kind of best practice I’m talking about here – filter early, in essence – then there may be a good reason. But that reason must be consciously and loudly acknowledged and documented. Cary Millsap recently published a paper “Mastering Performance with Extended SQL Trace” describing how to use Oracle trace to assist with troubleshooting the performance of database queries. It discusses how you can automate the tracing of specific sessions on the database, and requiring the application to be appropriately instrumented. This reminded me of a post that I made almost exactly 12 months ago here, where I explained how to pass through the username of the OBIEE user to the database. Initially I thought it would be useful simply for being able to pin a rogue query to an end-user, but reading Cary’s paper made me realise there is more potential to it. Why would you use it in OBIEE? Essentially, it enables you to precisely identify DB connections coming in from OBIEE. Since you can identify the connections, you can then trace them or collect additional statistics on them. In Production, this would be useful for helping with troubleshooting. If a query is behaving badly, the responsible user can be easily identified, and through the login ID matched back to Usage Tracking data (you do collect Usage Tracking data, right?). Conversely, if a user is complaining (unlikely, I know 😉 ) of performance issues you can easily spot their queries running on the database and get a head start on identifying the problem. As well as tracing, you can use these attributes to collect statistics (eg I/O wait time, db time, etc) for specific users or application areas. You use the DBMS_MONITOR CLIENT_ID_STAT_ENABLE procedure and then view the stats in V$CLIENT_STAT. Similar proc & V$ table exist for module-targeted statistics collecting. What would be really cool would be if we could pass through the details of the report being executed. It may be my misunderstanding of the subtleties of the flavours of OBIEE variables, but the behaviours seem inconsistent to me. For example, even though I am issuing a SET VARIABLE in my logical SQL, the value of the variable REPORT doesn’t change from its default (in this example ‘NONE’) when listed in the Session Manager or queried via Narrative view. It isn’t even shown if I don’t create it as a session variable in the RPD. Despite this, the modified value of the variable is what gets passed through correctly in the DB connection. If this could be harnessed and manipulated (eg right-most 63 chars) then the report details of any report could be automatically included with the DB connection string. But – try as I have I can’t access the variable through VALUEOF. Anyone know how? They’re full of real content and well worth a read. There’s excellent levels of detail and plenty to think about if you’re involved in OBI or DW development projects. We’re in the process of implemention Resource Manager (RM) on our Oracle 11gR1 Data Warehouse. We’ve currently got one DW application live, but have several more imminent. We identified RM as a suitable way of – as the name would suggest – managing the resources on the server. In the first instance we’re looking at simply protecting CPU for, and from, future applications. At some point it would be interesting to use some of the more granular and precise functions to demote long-running queries, have nighttime/daytime plans, etc. I’d also like to explore the management of IO but for us the pain is in bandwidth that a query consumes, and it looks like RM can only work with total session MB, or IOPS. Reading about Exadata it sounds like the Exadata I/O Resource Management might do this ([…]It allows intra and inter-database I/O bandwidth to be defined and managed[..]). But for that I’ll have to write to Santa and promise to be a good boy this year. Using Oracle Database Resource Manager – A very useful whitepaper about RM, with lots of detail about the workings of it. Our initial aim with RM is to do nothing more than ensure that everything we need to run does not do so at the expense of other applications on the server. A 64-way parallel beast of a query should not be allowed to freeze out lightweight workload from application backend processes (such as Usage Tracking, Informatica and DAC Repositories, etc). We’ve implemented this by grouping schema IDs from the four projects into consumer groups (PROJ_A_GRP, PROJ_B_GRP, PROJ_C_GRP, PROJ_D_GRP). The other group where users are explicitly defined is SYS_GROUP, for the SYS and SYSTEM users. All other users (i.e. those from application backend processes) go in the OTHER_GROUP. Our Resource Plan is this: CPU priority is allocated entirely to SYSTEM_GROUP. If any is remaining, it is allocated to OTHER_GROUP. Any CPU remaining after that gets divided up in quarters to the four project groups. It’s worth pointing out that Oracle itself manages Oracle core processes, in a group called _ORACLE_BACKGROUND_GROUP_. My understanding of RM’s control of CPU is that in essence it does nothing, until the database is under CPU pressures. Once queries are being constrained by CPU, RM will enforce the allocation of CPU between the various consumer groups as defined in the currently active Resource Plan. Note that RM is only within the Oracle context – it cannot do anything about non-Oracle processes on the same server using lots of CPU. An example of this that we’ve seen is ODI agents running local to the database – if these are doing lots of work then they may impact Oracle but we cannot use RM to control it. Here’s my understanding of how we’ll see RM in action – and as you’ll see from the tests that I run, I’m not sure that it is entirely correct. Generally, there will be no SYSTEM_GROUP activity, and very minimal OTHER_GROUP activity. This leaves the lion’s share for our application queries/ETL. Until the CPU on the box hits 100%, no throttling will be done. This is important to note. Our allocation of 25% CPU to PROJ_A_GRP only means that it is the minimum it can expect (see below – this doesn’t seem to be correct). If nothing else is running, it will get 100%. Conversely, if an application backend process (in the OTHER_GROUP consumer group) is using lots of CPU, let’s say 60%, and all four project groups are demanding CPU, then each will get 25% of the remaining 40% of the box’s capacity, i.e. 10% host CPU. It’s important to know that RM is doing what we think it is, and to also be able to determine the current state of a system in terms of resources. If a system is at 100% CPU and users are demanding why RM “isn’t working” it will be useful to prove that it is non-Oracle processes creating the CPU demand. I’ve been working on some queries to both validate and monitor RM. This excellent whitepaper on RM has some queries illustrating how to use v$rsrcmgrmetric_history to report on RM behaviour. I built on this to incorporate V$SYSMETRIC_HISTORY to source host CPU %, creating this query which infers the workload on the system. We’re looking at system statistics per minute slice (which is the level that v$rsrcmgrmetric_history is at, and then GROUP_ID=2 on V$SYSMETRIC_HISTORY). CPU count – From v$osstat where stat_name = 'NUM_CPUS'. Total Used Seconds – Total CPU time, divided by the host CPU utilisation. So if the CPU is at 50% utilisation and there are 480 CPU seconds available per minute, then logically 240 CPU seconds must have been used over that minute. Note that this is the total number of CPU seconds used, both Oracle and Non-Oracle. Non-Oracle Seconds Used – Total CPU time, divided by the host CPU utilisation, minus the number of CPU seconds Oracle has used. From the above derived figures percentages are calculated too. ,60 * (select value from v$osstat where stat_name = 'NUM_CPUS') as "Total Available CPU Seconds"
,sum(rm.cpu_consumed_time) / 1000 as "Used Oracle Seconds"
,min(s.value) as "Used Host CPU %"
,(60 * (select value from v$osstat where stat_name = 'NUM_CPUS')) * (min(s.value) / 100) as "Total Used Seconds"
,((100 - min(s.value)) / 100) * (60 * (select value from v$osstat where stat_name = 'NUM_CPUS')) as "Idle Seconds"
,100 - min(s.value) as "Idle Host CPU %"
e from v$osstat where stat_name = 'NUM_CPUS')))*100 as "Non-Oracle CPU %"
,(((sum(rm.cpu_consumed_time) / 1000) / (60 * (select value from v$osstat where stat_name = 'NUM_CPUS'))) * 100) as "Oracle CPU %"
N.B. at high CPU usage I’ve seen errors appear in the derived numbers, with negative values for non-oracle time and percentage. I’d speculate that this is because we’re dealing with percentage (CPU) figures averaged out over a minute, but cumulative figures (used Oracle seconds) over the same period. COLUMN name format a11 head "Consumer|Group"
Very satisfyingly, for each 60-second slice Oracle is using just under 60 seconds of CPU – i.e. my script is loading one CPU. I can’t explain (explanations welcome!) why V$SYSMETRIC_HISTORY is [apparently] incorrect for this period. Having seen that RM is correctly assigning our different users to the appropriate consumer groups, we can start testing how RM behaves once the host CPU hits capacity and RM has to start throttling its allocation to the groups. We can see that of the 480 CPU seconds available in every minute slice, Oracle is using almost all of it – around 470 seconds. Looking at Resource Manager, we can see that it kicks in – in the time slice beginning at 18:30:50, Oracle constrained one or some of the queries by a total of 30 seconds. Using rm_02 we can see how this divides up among the sessions. “CPU Wait Time (s)” corresponds to the “Oracle Throttled Time (s)” in rm_cpu_01 and rm_05(bearing in mind different levels of granularity since one is per minute / consumer group and one is per session total). Note that the throttling is applied pretty much equally to both consumer groups. In plan terms, CPU for level 1 (100% to SYS_GROUP) is unused, so passes to level 2 (100% to OTHER_GROUP). OTHER_GROUP consumes a small amount, and note that it is not [really] throttled. The remaining CPU (96%, from rm_cpu_01, minus 6% shown in rm_05 output = c.90%), is passed onto level 3 of the plan. Whilst the four projects are defined an allocation of 25% each in the plan, two of the consumer groups are not consuming their chunk, so it is divided up amongst the groups that are, according to the ratio of their allocations. Hence, PROJ_A_GRP and PROJ_B_GRP are using c.45% of host CPU. N.B. see below for discussion around allocation of CPU, as this statement about ratio may not be true. Test 04 above showed that RM applies throttling evenly to consumer groups, but it could have been influenced by an equal number of sessions for each consumer group running (that is, if it had throttled in a round-robin manner the result could have been the same). This test will run a similar workload, but with a skewed number of sessions; 1 PROJ_A_GRP and 7 PROJ_B_GRP. The test began at 2010-09-10 19:03:22. So – PROJ_A_GRP is getting all the CPU that it needs (since it is shown as having zero CPU Wait Time (rm_02) and zero throttled time (rm_05). The session is also shown (in rm_05) as consuming almost 60 CPU seconds in a 60 second time slice. The PROJ_B_GRP has two sessions that apparently run unconstrained, and five that are throttled by RM. The output from rm_cpu_01 above shows that RM throttles the queries by roughly 80 seconds of CPU time per minute. Over five sessions (and rm_02 above shows the constraining being applied equally) that equates to c.16 seconds of CPU time per session. Even once the first queries complete c.19:17 and the CPU usage drops further, RM still appears to throttle the PROJ_B_GRP queries. I would have expected to see all seven PROJ_B_GRP sessions constrained at the same rate. Why were the PROJ_B_GRP queries throttled even when there was idle CPU? From 19:17 onwards there was around 35% idle. FWIW the scripts were started from a shell script similar to above, with the PROJ_B_GRP sessions first, and then PROJ_A_GRP session. In Test 05 PROJ_A_GRP was running only one process, so would not be demanding as much or more than its theoretical 25% allocation. This test will run three PROJ_A_GRP sessions and which would (based on Test 02 above) require c.36% host CPU to run. In addition I will run six PROJ_B_GRP sessions, theoretical CPU requirement of c.72% host CPU. The total CPU should be driven above 100% and RM kick in. My understanding (which could be wrong) of RM is that it will do as it did above when there were equal numbers of sessions in each consumer group to throttle; it will allocate the resource 50:50 to the two consumer groups, even though the ratio of sessions will be 1:2. The test started at 2010-09-10 19:43:51. The results were different from what I had expected. Is it possible that CPU isn’t hitting 100% because RM is throttling the queries too much? I suspect I’m misunderstanding something about how RM is supposed to work and/or how it is implemented to do what it does. Leaving to one side my inability to explain the above observations with RM, I then wantd to add more load so that the machine would be under serious CPU pressure, and see how RM dealt with it. The test began at 2010-09-10 20:21:49, taking a total of three seconds for all 17 scripts to start. As before, CPU did not hit 100%, but instead hovered around 87%. We’re quite clearly generating load sufficient to hit 100%, but RM is throttling it back. Whether it’s the effect of swapping queries on and off CPU that means there’s an efficiency loss, or whether RM deliberately holds it back to that level deliberately I don’t know. So, I’m puzzled – I thought that RM was supposed to allocate a guarenteed amount of CPU to each consumer group. But here we’re seeing consumer groups with only one session getting apparently muscled out by those with multiple sessions. If OTHER_GROUPS is taking 25%, that leaves a hypothetical 75% between four consumer groups to split 25% each (so c.18% each). Instead two of the four get 25% total host CPU and two get about 6% host CPU – not 25% of the remainder of the pie left by OTHER_GROUPS. Why aren’t and PROJ_B_GRP PROJ_D_GRP getting an equal share of CPU as PROJ_A_GRP and PROJ_C_GRP? I’m going to re-run some of the above tests to check that the same behaviour is seen. I’m also planning to test with non-Oracle processes using lots of CPU to see how RM deals with that. We’re considering how RM fits into Performance Testing our applications, as it introduces quite a possible varience in the response times the users could see in Production. Finally, it will be interesting to observe RM in action against real DW workloads where there may be lots of I/O waits and not pure CPU demand. It’s been very interesting running these tests and looking closely at what RM appears to be doing. Some of my understanding & assumptions have been challenged, and I would love to hear from people with more experience and knowlegde of RM and Oracle to explain what I’m observing and where I’ve gone wrong. All of the query results quoted here are representative of the steady-state seen during each test. I’m sure I’ve just misunderstood part of the principle of RM, but I would like to know in what way 🙂 and also if there is a way to implement what I thought we had – a way of ensuring that of four consumer groups they all get a fair and equal bite of the pie. @alexgorbachev tweeted me recently after picking up my presentation on Performance Testing and OBIEE. Why is the measurement being done? then we can consider simulating a user and recording response times this way. After all, what difference does it make whether it’s Jim, Jemima or Jeremy using the system, or a simulated web client? They’re all sending an HTTP request to the same web server, hitting the same presentation services, BI server, and database. then we need to audit and trace user activity through some means. We can’t use a simulated user session, because it would only ever be that – simulated. If a user says that the system performance is awful then you need to be able to quantify and diagnose that, and the best way is through their eyes. A simulated user is only ever going to be a best-guess of user activity, or even if it’s a replay of past behaviour it may not be the same as they’re doing currently. These considerations also feed into the point at which we take the measurements. There is no out of the box tracking of response times at the end-user, but there is out of the box tracking of response times at the BI Server. If you are happy to settle for the latter then you save yourself a lot of work. If your requirement is to give an extremely accurate figure for the response time at the end-user then Usage Tracking data from the BI Server is irrelevant (because it doesn’t account for time spent in Presentation Services). However, if you know anecdotally that your reports aren’t that complex and generally time in Presentation Services is minimal then you should consider Usage Tracking, unless the precision required for response time is so great. Consider which is better – to spend an hour configuring Usage Tracking and get response times accurate to within a few seconds (assuming that Presentation Services time is either minimal or consistent so can be factored in), or spend x days or weeks trying to hack together a way or measuring times at the end user — is the extra accuracy definitely necessary? See slides 11-13 of my presentation for more discussion around this and defining the scope of a test and measurement taking. So, these thoughts aside, what are the options for examining response times at the end-user point of OBIEE? As discussed above, Usage Tracking data will get you the response times at the BI server, but doesn’t include anything upstream of that (Presentation Services, App/Web server, network, client rendering). Log mining – sawserver – The presentation services log file, sawserver.log, can be configured to record detail down to a very low level, certainly enough to be able to track user requests and responses. However unless you’re looking at diagnosing a problem for a specific user then this method is probably unrealistic because such levels of logging on a production server would be unwise. Client side logging – some kind of hack to monitor and record the user’s experience. Something like FireBug or Fiddler2 in logging mode? Not very viable unless it’s low number of users and you have access to their web browser & machine. Bear in mind that options 1 and 2 only give the response time as far as Presentation Services; they do not include network and rendering at the client. In some cases these times can be considerable (particularly if you have badly designed reports). Simulate user client activity – Use a web client testing tool (eg. Load runner, OATS, Selenium) to record and replay user actions in Answers/Dashboards as if through a web browser, and capture the timings. NB just because Load Runner is best known for Load testing, there’s no reason it can’t be used for replaying individual users to measure standard response times rather than under load. I think (although haven’t tried) HP’s BAC can also replay LoadRunner VUser scripts and capture & monitor timings over time, alerting for deviances. Go URL – Documented in Chapter 11 of the Presentation Services Admin Guide (and Nico has a nice summary and set of examples here), this is a way of issuing direct requests to Presentation Services by building up the request in the URL. Using this method you could then wrap a simple wget / curl script around it and build up a set of timings that way. Bear in mind that Answers/Dashboards are asynchronous so the first server response may not equate to a fully-loaded dashboard (you may get “Searching … ” first, and then the chart/table is delivered & rendered). See some of the discussion on my earlier postings around Load Runner, particularly this one. Web services – documented here, this would be similar to Go URL, in that it’s a way of requesting content from Presentation Services in a way that can be scripted and thus timed – but again is not necessarily reproducing the full user experience so make sure you’re aware of what you are and are not actually testing. Can anyone suggest other options?